We're the world's largest urban axe throwing company. We promise you that we'll show you an unforgettable time. People book private events, celebrate special occasions and join our leagues. Companies love bringing their clients and employees to Bad Axe because of how fun and great of an experience it is. We host group events (or have walk-in axe throwing for smaller groups) that range from 1 - 2 hours of axe throwing fun. 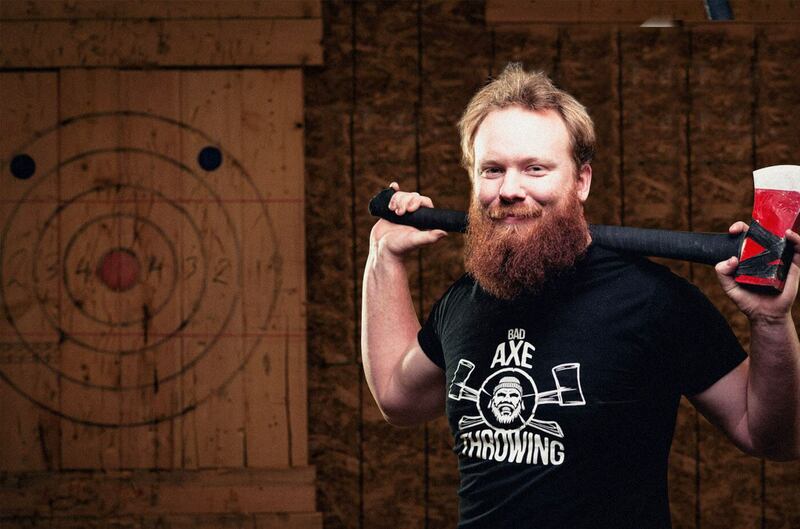 Every event has dedicated axe throwing lane(s) and a dedicated axe throwing coach that will teach you how to throw an axe while playing fun games. If you're looking for an awesome time, you came to the right place. Book today. Don't take our word for it. Check out what people have said about Bad Axe Throwing. Check out our awesome reviews from our customers across Canada & the US. Something everybody should try at least once...because you'll want to go again! I decided to book axe throwing for my birthday and it was the best decision! This is so awesome in so many ways: it's fun, great workout and stress reliever! It was a party with axes. Many thanks to our host and I'm hoping to go back soon. What a great time! Adida was our host. She was knowledgeable and made the event fun. Walked everyone through step by step. Great laughs and a great workout. Hosted a bachelorette party at Bad Axe this past weekend and we had such a blast! Hannah (our instructor) was very encouraging and patient with our not so stellar start and before you know it we were throwing double axes like pro lumber Jills. Sending pictures of the bride with an axe in her hand to her soon-to-be husband was also hilarious and well worth the booking. Would highly recommend. Me and 7 others came here for a number of our birthdays (all within a few weeks of each other) and it was a great experience. Our instructor was great and funny who taught us how to properly throw the axes, and set us up for some fun games and competitions. It was nice to be able to play our own music, bring our own snacks, and be able to drink the beer we brought. Definitely recommend it for a birthday, staff outing, friends night out, or bachelor/bachelorette party. Our Axe Throwing Leagues run for 8 weeks, the first week being round robin to get the hang of the league, format and scoring system. You don't have to purchase any equipment. Simply show up each week. Limited availability. Place both hands on the axe. Firm like you're holding a baseball bat. Make sure the blade is perfectly straight. special occasion, or just for fun! Policies Agree to cancellation policy? Each throwing lane is reserved with a deposit of 2 admissions. Your selected group size requires 2 throwing lanes so your deposit is 4 admissions. Reserving 2 lanes has a 25 ppl minimum requirement, which means you still have to pay for 25 people even if you have a smaller group size. Are you a member of the media and want to get in touch with us?